It is a vast improvement over the Panzerjäger I. It has a great penetration and damage with its cannons, especially the 7,5 cm PaK 40/2 L/46, which can hurt all other vehicles one or two tiers higher, even able to penetrate a KV-1 up front when hitting weaker spots. With more engine power and a better gun than the Panzerjäger I, the Marder II is a decent tank to play whilst heading further up the tank destroyers line, a few players even keep the tank after they have finished researching it, though it is important to remember that although the guns have great damage and penetration, they fall short in terms of rate of fire and aim time, but with patience the Marder can lay waste to its enemies. It is ill-advised to engage in close quarters as its low HP and poor armor may result in a quick death. Keep in mind that the tank's open-top crew compartment has virtually no armor, making it extremely vulnerable to howitzers, autocannons and semi-automatic cannons. It is recommended to equip the Binocular Telescope to enhance its view range, which can be key to winning in small maps such as Province. Curiously, what is essentially the same gun on the FCM36 PaK40 has somewhat better rate of fire, accuracy and aim time than the 7,5 cm PaK 40/2 L/46 on the Marder II. Nonetheless, the increased penetration compensates for these drawbacks. But with its low rate of fire and small ammo capacity, precise aiming is an absolute must as missing a shot in battle could prove costly. The FuG 5 radio is the only thing that carries over from the Panzerjager I. Install it immediately. First research the Maybach HL 62 TRM engine. Now you can research the 7,5 cm PaK 40/2 gun. You may now unlock the top gun or just go for the Hetzer, whichever you prefer. The Marder II was a German tank destroyer of World War II based on the Panzer II chassis. During the very first days of Operation Barbarossa, the invasion of the Soviet Union, the Germans were shocked to encounter Soviet T-34 medium tanks and KV heavy tanks. Although the Wehrmacht succeeded in most operations due to superior tactics, morale, and supply, it had few anti-tank weapons capable of successfully engaging these vehicles at normal ranges. An urgent need arose for a more mobile and powerful anti-tank weapon than the existing towed anti-tank guns or tank destroyers like the Panzerjäger I. Among a series of solutions, it was decided to use light tanks like the Panzer II and captured vehicles like the Lorraine Schlepper as the basis for makeshift tank destroyers. 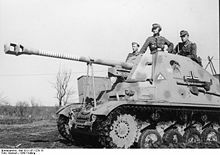 The result was the Marder series, which were armed with either the new 7.5 cm Pak 40 anti-tank guns or captured Soviet 7.62 cm F-22 Model 1936 field guns, large numbers of which had been acquired early in the war. The second version Marder II (Sd.Kfz. 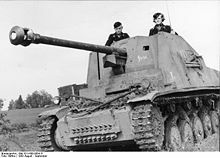 131) was based on Panzer II Ausf. A to C removed from active service but later also newly produced Ausf. F chassis were used. This Marder II had a redesigned (widened) fighting compartment and used the German 75 mm Pak 40 anti-tank gun. The silhouette was lowered by about 40 cm to 2.20 m, but the armor was thin and the compartment was open to the top and rear, as in Sd. Kfz. 132. FAMO, MAN and Daimler-Benz produced 576 Marder II (Sd.Kfz. 131) conversions from June 1942 to Mid 1943. 75 more were converted (probably by FAMO only) from mid 1943 to early 1944 when the last Panzer IIs were taken out of active service. The various Marder IIs fought on all fronts of the war, mainly at the Eastern Front. 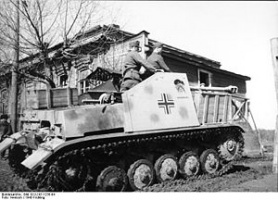 The Marder IIs were used by the Panzerjäger Abteilungen of the Panzer divisions of both the Wehrmacht and the Waffen SS, as well as several Luftwaffe units. The Marder's weaknesses were mainly related to survivability. The combination of a high silhouette and open-top fighting compartment made them vulnerable to indirect artillery fire, shrapnel, and grenades. The armor was also quite thin, making them vulnerable to enemy tanks or infantry. The Marders were not assault vehicles or tank substitutes; the open top meant that operations in urban areas or other close-combat situations were very risky. They were best employed in defensive or overwatch roles. Despite their weaknesses they were much more effective than the towed antitank guns they replaced.